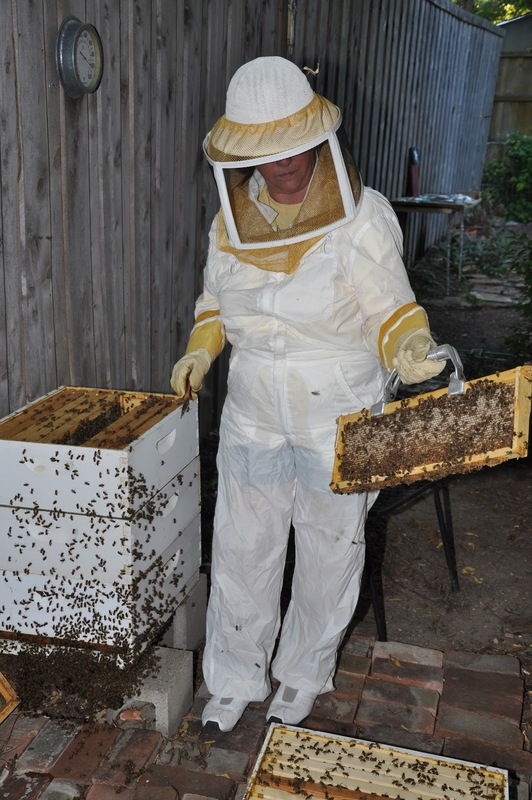 My friend's mom is a beekeeper! Fermin and I got to go over to her house and watch her in action the other day. We both took our cameras of course, but all my shots were taken from inside, behind the safety of a window, and they turned out a little murky. The pictures below were all taken by Fermin since he was much braver than I was- although not nearly as brave as the beekeeper, Mimi! Mimi said there are something like 80,000 bees living in there. Wait. Is that right? I think that's what she said. Anyway, many of them are coming out down at the bottom of the white container to get a little fresh air on a hot summer day. And can you believe one queen rules the whole thing? Queen bees are so cool. Here is song number 19 of 50 for my summer songwriting challenge, called "Honeybee". Kerri I bought that dress very recently (within the past couple weeks) at a private event he held, but it is at shopbop (I think the link's on the blog). They only have it in black and it's a part of the new fall line so I bet more colors will show up. It's not on his site at all. Watch at Nordstrom and Shopbop - I'll let you known when I spot it again. ps- i always joke about needing a bee suit for sample sales and whenever I'm around children. nice aren't i? oh my goodness, i wanted to be a beekeeper once...this is a wonderful post! and your song is sooooo sweet! Such a beee-utiful post, Kerri. 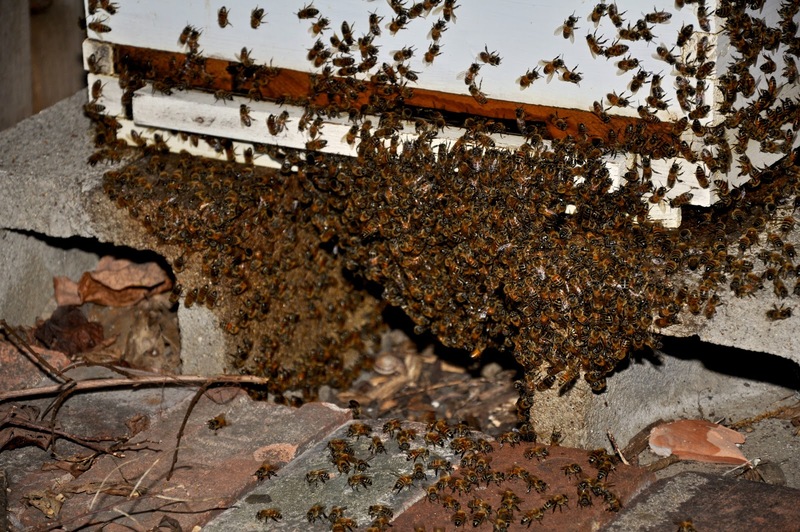 Isn't it amazing how many bees there were in that hive and, like you say, managed by only ONE queen! Absolutely adored your new song - gorgeous words and cheerful, catchy tune. Hi Kerri! Gorgeous song, and a really lovely voice you have too - beautiful. I do musical theatre in my spare time when I get a chance, and enjoy it very much. I also teach performing arts part time at primary school level.... lots of fun! Music is a huge part of my life, couldn't live happily without it. Going to check out your CDs now. PS. 80,000 bees.... WOW!! Amazing. What a lovely song! I admire anyone who can play an instrument AND sing at the same time. I play the piano quite well but there is NO way I can do both simultaneously! That's so sweet! I myself would be so scared of the bees. Your friend's mom sounds like a rather cool lady! Bees are such fascinating creatures, however I couldn't quite imagine getting that close to them either, much like you! I love this sweet song, it's really lovely! Beekeeper is awesome!! That is such a wonderful hobby. I really adore your song and singing so much!! Thanks so much for sharing. Have a lovely merry happy week and love to you! WOW - the bees are amazing!! Apparently, I'm somewaht allergic, so each time I get stung the reaction is a little worse. Not surprisignly, I'm pretty shy around them but I do get how important their work is. I LOVE that you used the bees as a stimulus for a song. It's wonderful - I think I'm going to listen again!! I love that song! How cute! Love your creativity. Bees are amazing creatures. I wish we had more honeybees and less mean, nasty wasps...And I don't blame you at all from taking pictures from inside - even still I know I would feel them crawling on me. This is so cool! 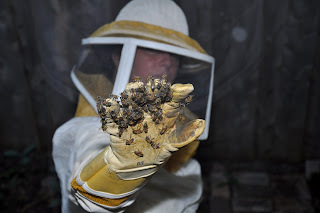 You should check out Savannah Bee Company (savannahbee.com), we roast honey-roasted coffee for them, very cool company! XO! Thank-you for sharing it with us. I've been so busy , But I'm back to visiting blogs. You are SO brave with all those bees . Yikes. The pictures definitely give the bee charged atmosphere. great song< i'm impressed by how many you manage to write. 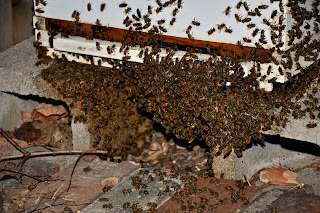 We have a wee bee shortage as well because of Verroa (sp) mite. My father in law has hives though and I love to be near them! I am severely allergic however, but have this wierd sense of calm when I am around them. All very strange! bees are such wonderful images and inspirations for creative busyness! love your interpretation!